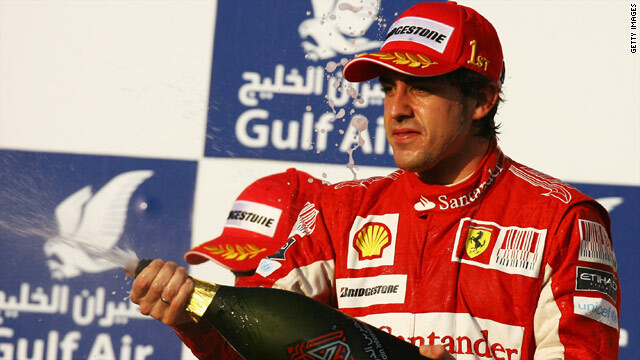 Fernando Alonso toasts his victory for Ferrari in the opening Formula One race of the season in Bahrain. (CNN) -- Fernando Alonso says the reaction of his fellow drivers to Formula One's controversial new rule changes after the opening Grand Prix of the season was "hot-headed." The Spaniard claimed victory in Bahrain on his debut for Ferrari but fellow drivers Michael Schumacher, Lewis Hamilton and Jenson Button were critical of 2010's new laws. They include a ban on refuelling during the race and that the grid's top ten drivers must start the race on the tires they used to complete the final qualifying session. But Alonso says it is too early to consider changing the rules and has pleaded for patience. He said on Ferrari's official Web site: "I think that many of us have given some hot-headed comments immediately after the race in Bahrain. "It's true that the race in Sakhir wasn't especially spectacular -- although for us Ferraristi it was great and exciting -- but it's too early to talk about changing the rules. I think that many of us have given some hot headed comments immediately after the race in Bahrain. "We have to see how the tyres behave with different fuel loads and temperatures, which will be different from the ones we had during testing and in Bahrain. "We have to wait and see different races and check the situation, without being emotional. Something that confuses the fans is changing the rules all the time." Alonso and teammate Felipe Massa gave Ferrari the perfect start to the season with a one-two in Bahrain, but the Spaniard says no-one is getting carried away. He added: "The one-two win in Sakhir gave us confidence and was a great result for the hard work during the winter on the track and at the works, but we can't take anything for granted. "We have to stay with our feet on the ground, keeping calm and staying concentrated -- in Melbourne we're starting from square one. "Nothing has changed for me -- there are four teams and eight drivers who can fight for victory and we have to give it our all to stay ahead of everybody else. "I like the Albert Park track. It's quite a technical circuit with some pretty interesting corners. Overtaking has never been easy and what is even more important now, like on all city circuits, is the result in the qualifying."